Recent data gathered by Yahoo-owned firm Flurry Analytics illustrates a growing interest in health and fitness apps, a category that has skyrocketed in popularity over the past months to become some of the most used digital properties in terms of frequency and duration. 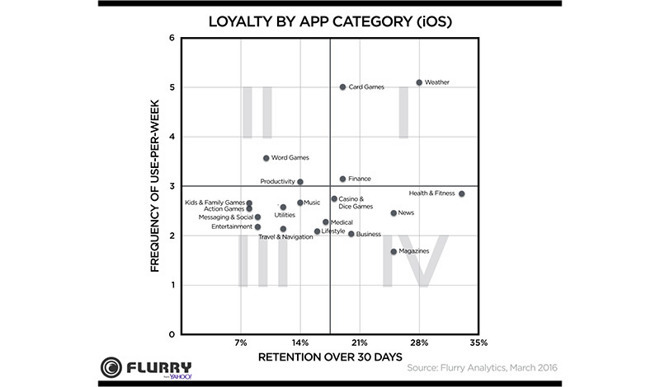 According to Flurry data, health and fitness titles enjoy the highest loyalty rates of any iOS app category. Perhaps driven by Apple Watch, about 35 percent of iPhone users who download a health tracking app retain the software after a period of 30 days, using it just under three times a week on average. The same is true for Android, which boasts a whopping 49 percent retention rate and usage frequency of over three times each week. It's not hard to see why. Apple has made health a priority, and we can see that with HealthKit, ResearchKit, and more recently CareKit, which is a way for iPhone users to have a more active role in their health. These apps are taking center stage in the App Store, even showing up in this week's Featured Apps list. The data dovetails with a report last week claiming Apple Watch was created first and foremost as a health quantification tool. Late Apple CEO Steve Jobs is said to have tasked his company with fixing a chaotic healthcare system by making it easier for patients and healthcare providers to gather, track, share and analyze health data. Executives came up with Watch. Flurry compared its statistics, aggregated in March from a sampling of more than 830,000 apps across iOS and Android, with an identical study performed in 2012. The firm found users are more willing than ever to take new apps for a test drive, meaning churn rates are on the rise. Breaking iOS data down by category finds weather to be among the most "sticky" apps, and with a loyalty rate of 28 percent the category is only bested by health and fitness. News and magazine apps both saw a 26 percent user retention rate. At the other end of the spectrum are gaming apps. Users might pick up a game and play it a lot at first, but overall retention rates are poor. Depending on the type of game, retention rates range from 8 percent to 20 percent for iOS and 5 percent to 15 percent on Android.